A concentrated and accurately dosed washroom cleaner suitable for use on surfaces and toilet bowels passes BS EN 1276. Economical in use. Pleasantly perfumed concentrated all round washroom cleaner containing a powerful bactericide. Kills bacteria on all hand touch surfaces, taps, toilet flush handles, door handles, also acts as a toilet bowl cleaner. Can be used in a bucket or with trigger spray bottles. Environmentally friendly as it saves on packaging, transport and storage. No additional dispenser required. Passes BS EN 1276. Economical in use 100 shots per 1 litre bottle. 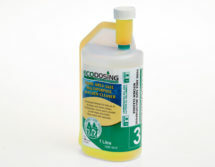 Part of the Ecodosing range.